WHAT IS A QUALIFIED ELECTRONIC SIGNATURE? A qualified electronic signature is information through which it can be checked whether in fact you created a document and if it’s been changed in any way. To make an electronic signature you have to have a secret number to create the signature (a personal key) and a corresponding public number for verification (a public key). The secret number is stored securely by Evrotrust on a server and is accessed through an encrypted method via a mobile application through your PIN, fingerprint and face recognition technology. The public key is certified through a special qualified certificate – an official electronic document which is publicly accessible for verification and through which everyone who receives a document signed by you can check whether you in fact signed it. There are three types of electronic signatures: basic, advanced and qualified. • Basic signature: An example of an ordinary signature is your signature made with an electronic pen. It’s the least legally-assured signature. • Advanced signature: An example of the advanced signature is the token signature in online banking. It is legally-assured if both sides agree to express their agreement through it. • Qualified signature: The qualified electronic signature is issued by a contractor of certification services. 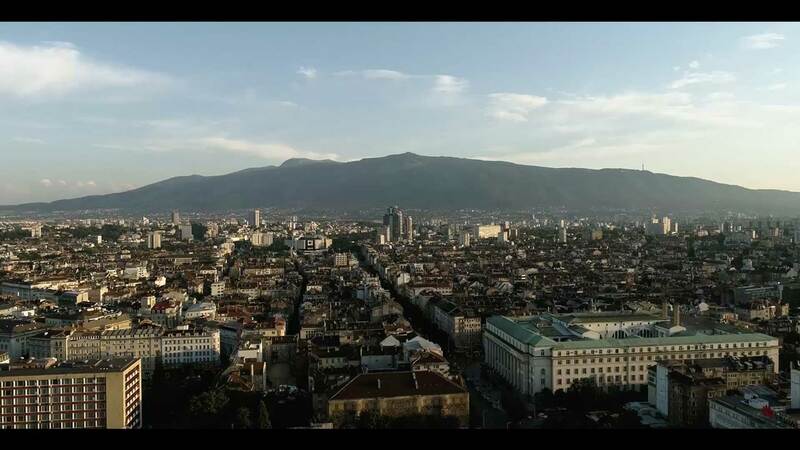 It has been made of equal value to the handmade signature through the power of an EU regulation and it is issued according to the highest security levels. WHAT IS AN ELECTRONIC SIGNATURE CERTIFICATE? HOW CAN I GET AN ELECTRONIC SIGNATURE FROM EVROTRUST? The qualified certificate for an Evrotrust electronic signature is issued remotely and easily and there’s no need to visit a company office. The only thing necessary is an ID document and an internet-connected smart device with a functioning front camera. You can download and install the Evrotrust application from the App Store, Google Play or from the company’s official website www.evrotrust.com. To be issued a qualified certificate for an electronic signature the law demands that you be identified. Through a mobile device that is an automated process which takes 2 minutes. Immediately after that you will be issued remotely with an electronic signature certificate. Downloading and installation of the Evrotrust mobile application is free of charge and so is the issuing of the qualified electronic signature certificate. The profile comes automatically with the FREE subscription plan that includes 5 remote electronic signatures or remote identifications within the space of 1 year, for those who want to try the service. Additionally, anyone can subscribe to one of the two affordable subscriptions – BUSINESS or UNLIMITED – depending on the frequency of use. BUSINESS includes 5 signatures or identifications per month and UNLIMITED an unlimited number of signatures or identifications. 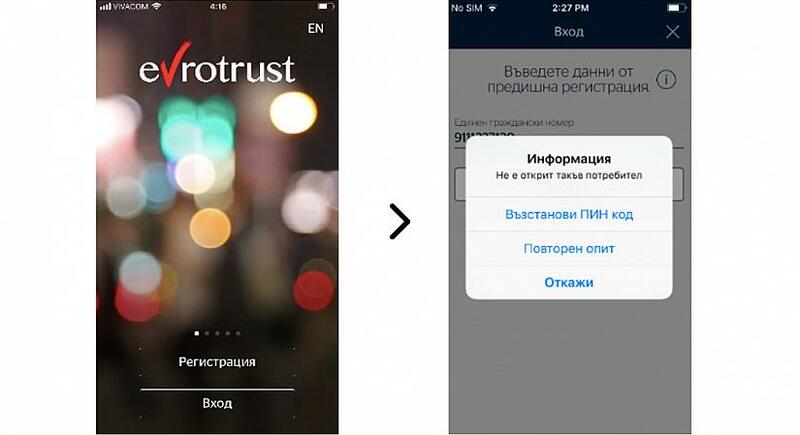 If Evrotrust is integrated with a service provider – for instance a bank, an insurance company, a mobile operator etc. – then signatures and identifications for the use with that service provider are free of charge for the user. WHAT DEVICES AND SOFTWARE SHOULD I HAVE? You must have only a smart device – a smartphone or a tablet. It is used for authorisation of the signing. The application is runs on iOS (10.0 version or newer) and Android (5.0 version or newer). The creation of electronic documents is done through commonly used software – Word, Excel, Adobe, Pages etc. The sending of the document for signing happens easily. It can be conveniently and quickly through the Evrotrust website (www.portal.evrotrust.com) available in all browsers or additionally It could be uploaded directly from the application in the Documents section. There is no longer need to install special additional devices, card readers or software, nor are you required to have any special technical skills. IS EVROTRUST’S ELECTRONIC SIGNATURE LEGALLY-ASSURED? The qualified electronic signature has the same legal value as the hand-made signature done on paper. That is based on point 2 of Article 25 of the 910/2014 EU Regulation and the rule is valid for the whole of Europe. In order to be able to issue electronic signature certificates, Evrotrust has gained a special status of a qualified provider of verification services. 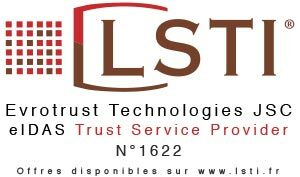 We are certified by an independent French body (LSTI) and we’re included in the European Commission registry (LINK). IS EVROTRUST’S ELECRONIC SIGNATURE SECURE? Evrotrust’s remote qualified electronic signature provides a much greater level of security than standard electronic signatures created on smart cards. The electronic signature is made through cryptographic cyphering and deciphering algorithms via the use of cryptographic keys. With the smart card electronic signatures, the personal key used to create the signature is stored on an additional device, which requires users to have certain skills, to install drivers and to use a specific computer. The patent pending technology developed by Evrotrust makes it possible for the personal key to be stored on a remote cloud-based hardware cryptomodule (HSM) with the highest level of security, and not on the smart device itself. Because of this, losing your phone does not pose a threat to the security of your electronic signature and it doesn’t matter how many different devices you will use to sign electronically. Your smart device is only a connection to the “environment” where your secret key is stored. To create the signature, you use something you have (your smart device and the personal key stored in the “safe”) and something you know (your PIN code). Every time you access the application and you sign a document you’ll be required to enter a PIN code or another type of biometry available on your phone (fingerprint, face recognition, iris biometry, voice recognition etc. ), and a confirmation notification is sent after every signature. As Evrotrust’s qualified electronic signature is issued remotely, in a system which neither the user nor the service provider has access to, and due to the fact that for each signing there are two channels used – the system is practically immune to hacker attacks. In addition to this, Evrotrust’s activity and its employees are insured at a high level by a leading European insurance company against all risks of professional negligence. WHAT CAN EVROTRUST’S ELECTRONIC SIGNATURE BE USED FOR? With an electronic signature you can sign everything you currently have to sign on paper, but it is far more convenient. You can sign remotely from all parts of the world any time of day with the certified time of signature and a guarantee that the contents are inalterable. You can use it to sign powers of attorney, contracts, declarations and all other types of documents as an individual, but with it you can submit your tax declaration, a declaration in the trade registry or letters of appeal for all kinds of administrative services to state institutions. Through Evrotrust’s system of identification, you can sign a tenancy agreement, open a bank account remotely, apply for insurance or change your mobile number or mobile service provider, without leaving your seat. Evrotrust is a special advantage to companies that want to enter the new age of entirely digitalised customer service. It gives them a unique tool for intercompany relations with employees – declarations, labour contracts, documents regarding work leave etc. CAN I INSTALL THE APPLICATION ON MORE THAN ONE PHONE OR TABLET? Yes, the Evrotrust signature application can be installed on an unlimited number of devices (tablets and smartphones). They are just a connection to your key to create an electronic signature which is stored on a secured crypto server. Sensitive information is not stored on the end device, that’s why there’s no limit to the number of devices you can use. WHAT IF I LOSE MY MOBILE PHONE OR SOMEONE STEALS IT? Nothing to worry about. To activate the application there are security guards like the need of a PIN, fingerprint, face or other type of biometry, before access and signing of the e-signatures A combination of several methods of access guarantees your profile remains secure. For greater security there is a way to deactivate lost or stolen devices. After that the application on the lost device would not be accessible. You can always call Evrotrust on our numbers and your profile can be limited and your issued qualified certificates can be stopped. I’M A BUSINESS OWNER (EMPLOYEE). CAN I SIGN COMPANY DOCUMENTS AND CONTRACTS? The electronic signature is always personal. What is important is the position from which a specific person uses it. Thus, you can sign it as an individual or as a company employee. The Evrotrust application enables the issuing of a qualified electronic signature certificate and through the inclusion of business entities in the certificates with the Evrotrust electronic signature you can sign all kinds of documents with your partners, employees and customers with ease, unlimited by time or distance. IS THE QUALIFIED ELECTRONIC SIGNATURE VALID IN THE EUROPEAN UNION? Yes, Evrotrust is a certified qualified trust services provider according to 910/2014 Regulation (eIDAS), which applies to all EU member states. All certifications and signings by Evrotrust are valid and are automatically accepted in the whole of the European Union. Evrotrust is a registered personal data administrator by the Commission for the Protection of Personal Data according to the requirements of the law (certificate No. 415994), including regarding the needs of remote video identification. The personal data registers are maintained at the highest possible security level. The Evrotrust electronic signature is cloud-based. No confidential or sensitive information is stored on your smart device. Actually, you are able to sign through several devices (tablets, smartphones) on which you decide to install the application. IS THERE AN APPOINTED OFFICER, RESPONSIBLE FOR DATA PROTECTION AT EVROTRUST? In connection with the implementation of Regulation (EC) 2016/679 of the European Parliament and of the Council on the protection of individuals with regard to the processing of personal data and on the free movement of such data and repealing Directive 95/46 / EC (General Regulation on data protection), Evrotrust Technologies AD has appointed a Data Protection Officer. For questions related to the implementation of Regulation (EC) 2016/679, you can use the email address: dpo@evrotrust.com, as well as phone + 359 2 448 58 58. HOW LONG IS MY ELECTRONIC SIGNATURE CERTIFICATE VALID? The electronic signature certificate issued by Evrotrust is valid for a period of 2 years. After that you can apply for a new qualified certificate through the mobile application free of charge. HOW CAN I STOP MY ELECTRONIC SIGNATURE CERTIFICATE? The qualified electronic signature certificate can be stopped through the mobile application immediately by sliding left to right on the selected certificate. CAN I TEMPORARILY STOP MY ELECTRONIC SIGNATURE CERTIFICATE? Evrotrust doesn’t have a policy of a temporary stopping certificates. Instead you can stop a certificate and ask for a new one to be issued, bearing in mind that it’s issued free of charge. CAN I SIGN ONLY THROUGH A WEB WITHOUT THE APPLICATION? You can create your documents and files for signing in various formats and via any device through any browser – computer, tablet or mobile phone. 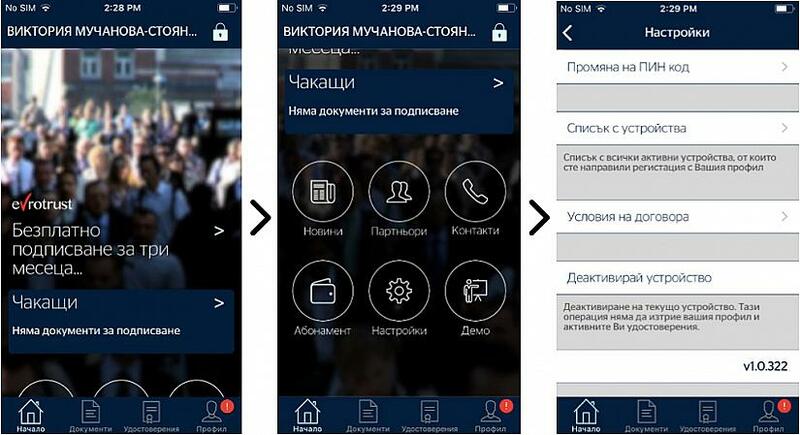 The signing of the documents can happen only via a smart device. That’s because the two-factor high security control is required for us to achieve a high level of security for users. I GET THE MESSAGE “YOUR DEVICE IS NOT COMPATIBLE WITH THIS APPLICATION”? As Evrotrust uses the latest security and encryption methods, the solution is not compatible with old version of smart phone applications. However, the current version of the operating system covers 97% of iOS and 92% in Android of the global market. You can check your operating system version and whether you can update it from your device settings. I FORGOT MY PIN CODE, WHAT DO I DO? For Android devices: Uninstall the application and download it again. Select enter. When you enter a wrong PIN you’ll be given the option to “Restore your PIN”. Select it and follow the steps. After you answer the three secret questions which you selected at the setting up of your profile, you’ll be given the option to create a new PIN code. You can call us if you have trouble following these steps. I LOST MY DEVICE, HOW DO I DEACTIVATE IT? If you happen to lose your device with an installed application on it, don’t worry. Get another device, from a friend or family member, download the application and LOG IN. CAN SOMEONE MISUSE THE PICTURE OF MY ID CARD? Evrotrust is a personal data administrator possessing a specific status and is a certified verification services provider, which uses an encrypted connection to receive and handle data from users’ devices in a secure environment. WILL I LOSE MY DATA IF I DELETE THE EVROTRUST APPLICATION FROM MY DEVICE? From Home → Settings → Device deactivation your profile is logged out of the current device. From Home → Profile → Settings → Profile → Profile deactivation you can delete your profile which means that you’ll no longer be a Evrotrust customer and access to the documents you have signed cannot be restored – they’ll be available only on the Evrotrust archive. WHAT DOCUMENTS DO I NEED TO POSSESS TO BECOME YOUR CUSTOMER? To be identified by Evrotrust and to get a remote qualified electronic signature certificate you need to have a valid identification document – an ID card, an international passport or a diplomatic passport. A driving licence cannot be used to verify your identity. HOW DO I SEND A DOCUMENT TO BE SIGNED TO ANOTHER PERSON OR COMPANY? The Evrotrust portal can be accessed on the home-page through the LOG IN button in the upper right or in the DOCUMENTS section through the mobile application. You can upload a document to be signed, which from many popular the cloud file storage solutions like Dropbox, iCloud, OneDrive, Google Drive etc. WHAT SHOULD BE THE FORMAT OF THE DOCUMENTS I SEND TO BE SIGNED? We recommend you convert your documents into PDFs in order to be signed with an integrated electronic signature (PADES). Otherwise the signature will be attached to the documents in a p7s format (CADES). PDF is an Adobe Acrobat format readable free of charge with an Adobe Acrobat Reader and several other free programs. From Microsoft Word and Excel you can save a document in PDF format from the menu File / Save as option. CAN I SEND MORE THAN ONE FILE TO BE SIGNED SIMULTANEOUSLY? The application allows you to send several files simultaneously. There is an option to choose whether the files will be signed simultaneously as a whole (in a CADES format) or each of the files to be signed separately, albeit with one authorisation. If the files are signed separately, those in PDF format will be signed with an integrated signature (PADES), and those in other formats – with an attached signature (CADES). HOW CAN I CHECK WHETHER A DOCUMENT HAS BEEN SIGNED? To check whether a document is signed with an electronic signature you can open it with the free program Adobe Acrobat Reader and at the top of the document this sign will appear “Signed and all signatures are valid”. Clicking the button in the top right-hand corner of the screen (Signature Panel) you’ll open the chain of certificates for checking the signature. CAN I SEND A DOCUMENT TO BE SIGNED BY SEVERAL PEOPLE? Yes, the system supports the signing by more than one person with a qualified signature. The functionality is accessed from the signature portal you can choose to send the document to be signed by more than one person. The system sends the documents consecutively to the designated persons to be signed in the selected order. Documents with all necessary signatures are accessed from the “Sent” section in the portal. CAN I SIGN A DOCUMENT ELECTRONICALLY AND THE OTHER SIDE SIGN IT ON PAPER? Yes, while you can communicate your will electronically and sign with a qualified signature, that doesn’t prevent the other side from creating and signing its declaration using a handwritten signature on a hard copy of the document. If all sides agree on this, then the contract will be completely valid. HOW CAN I OPEN OR SAVE A DOCUMENT IN PDF FORMAT? If you cannot open a PDF document on your computer, install Adobe Acrobat Reader from here https://get.adobe.com. You can create a PDF document through opening File / Save as from the most popular document processing programs e.g. MS Word, MS Excel or free of charge here http://topdf.com/ or here http://www.primopdf.com/.